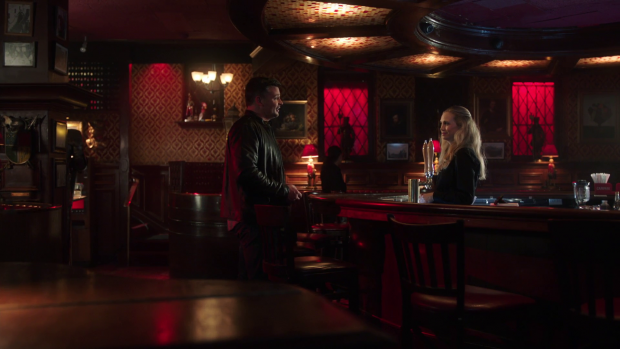 Lucifer continues to explore the Cain/Chloe connection when a murder is reminiscent of a case that Cain solved back in 1958. I wondered how long it would take to deliver a Cain flashback and this episode gives me my answer. It’s an old trope when immortal characters are involved and it’s something that can be interesting if handled correctly. Seeing a character we know well playing around in a bygone era and delivering insight into a small part of their past could be a great source of development. The focus of this episode is how different characters approach meaningful relationships. Cain has completely walled himself off from others and refuses to allow himself to form connections because he knows that they will end. Considering how long he has lived a few years of potential happiness seems insignificant in the wider context of his several millennia long lifespan. The scenes in 1958 offer a snapshot into Pierce’s approach to life by choosing a time just before he decides to move on and start fresh. Before he does so he’s fixated on solving a case involving a killer that goes after couples in love. It’s dramatically convenient in linking to Cain’s mindset when it comes to this. The character of Kay (Fiona Gubelmann) is introduced to show that it wasn’t always an easy decision because someone would occasionally prove worthy of his notice. They have instant chemistry which makes Cain’s doubts over his decision believable and allows their connection to feel natural with only a handful of scenes to explore it. Their parting moments are well delivered by Tom Welling and Fiona Gubelmann to convey the heartache felt on both sides. Cain has an opportunity to let down his barriers and be happy with someone but knows how it will turn out so stops himself no matter how much he wants to pursue it. Kay storms off with a broken heart and Cain moves onto somewhere else in order to continue his sad and lonely existence. 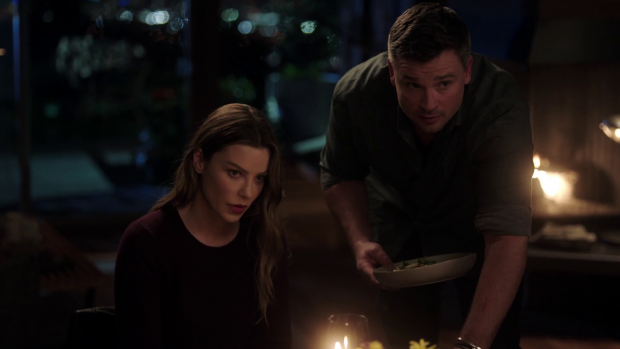 The appearance of Kay’s granddaughter Maddie (also played by Gubelmann) momentarily confuses Cain as he considers for a moment that he has encountered someone as ageless as he is. Of course reality sets in and his hopes are dashed but there is a hint that his loneliness is so profound that he is willing to believe the less likely explanation -impossible is relative in this show- when it’s possible that he could end up being happy. An identical granddaughter is one of those things that tends to happen all too frequently in fiction though this episode doesn’t make that big a deal out of it and it’s almost immediately clear that they are two different people thanks to Fiona Gubelmann’s acting ability. Her appearance proves Cain’s point as he is reminded that things change and move on while he doesn’t. The episode performs an impressive bait and switch when it comes to the flashback story affecting the present day. Recognising the details of the murders as being the same as the one he already solved in 1958 is a good excuse to dredge up those memories which makes the justification for the flashback internally consistent. The episode plays out as if Cain is reflecting on those memories and choosing to make a different decision so that he isn’t alone. His connection with Chloe is strong enough that Cain changing his outlook because of Chloe is a believable outcome. The reveal that he’s basically stringing her along because he thinks she’s what will enable him to finally die. How he has arrived at that conclusion and what his next move will be remains to be seen but his interest in her is certainly not romantic. Looking back on any of the scenes where he opens up to Chloe has a sinister subtext to it as any sign of being genuine is a lie and it makes a lot of sense that Cain would be an expert at appearing genuine given how long he’s had to practice. It’s a really clever way of subverting expectations and answers a problem that I hadn’t really considered until this episode. The problem is with Chloe herself on a conceptual level rather than as a character in her own right. Last week reveals that Lucifer has been lying to himself about his true feelings for her but has finally admitted them to himself even though it may be too late. If Cain was also infatuated with her then that makes two immortal characters who fall for Chloe. One is fair enough especially when their dynamic is one of the pillars of the show but two starts to have Chloe veer off into Bella Swan territory. Having two characters who have been around for pretty much all of creation attracted to one special snowflake of a Human being completely strains credibility even in a show about the Devil solving crimes so revealing Cain’s interest in her as some form of deception solved the problem before I even realised that it existed. To be clear, I don’t think Chloe is a bad character and she bears no relation to Bella Swan. This is purely conceptual and has nothing to do with how Chloe is written. She is a great character who has consistently strong relationships with other characters and has plenty of agency within the context of the show. Her ability to attract immortals is far from her defining trait so the potential problem was only with the idea of her being that desirable. Lucifer proves to be the jealous type as he actively tries to dissuade Chloe from pursuing a relationship with Cain for his own selfish reasons. It’s typical Lucifer behaviour and he goes about it in his usual roundabout way. Any mention of the possibility of Cain and Chloe being intimate with one another is childishly dismissed while demonstrating that Lucifer has basically put her on a pedestal thinking that she’s far too good to fall for Cain’s charms. Of course he knows the truth about Cain and his unflinching desire to kill himself which doesn’t make the best relationship foundation but since he can’t be honest about himself then there’s no way he can be honest about Cain so he has to find other ways to discourage this coupling. A deliberately concerning thing about Lucifer’s behaviour in this episode is that he feels possessive when it comes to Chloe. As far as he’s concerned she’s his in some way whether that be as a working partner or a romantic prospect and he’s immensely territorial about the whole thing. Part of the problem is that he’s unwilling to share her while also being resistant to letting their relationship progress so he seems content to maintain this holding pattern and keep her in this bubble meaning that nobody can “have” her while he opts not to “have” her either. A major part of the reason for that is that he still struggles with God using Chloe to manipulate him in some way by putting her in his path meaning he has walled himself off from her specifically in the same way Cain has with every potential romantic partner. This doesn’t quite work as Lucifer spends much of the episode acting like his main problem is Cain trying to steal his partner despite the fact that Chloe already expressed her own concerns about being replaced only two weeks ago. Lucifer may be distracted and behaving childishly but there should have been at least some commentary on the fact that Chloe has demonstrated how much she values their partnership on many occasions. I’ve mentioned before that the posturing on the Chloe/Lucifer relationship was becoming tiresome and that still happens to be the case. Lucifer’s lesson of the week is that Chloe doesn’t belong to him and that he has no right to dictate who anyone should be with. Tom Ellis plays that “lightbulb moment” wonderfully as he stares into the eyes of a killer who fails to understand what should be a fairly easy lesson. The case itself is a fairly clumsy way of getting there and I had long lost interest in it by the time the killer was revealed as with most of the cases but the lesson itself was well learned and Tom Ellis playing the realisation as if it was something obvious that he was missing was the right call. Amenadiel crosses paths with Charlotte for the first time which led me to realise that Amenadiel hadn’t met Charlotte prior to this episode. It’s something that I assumed had happened somewhere along the way or at least he had been told the situation off screen. Apparently this isn’t the case and he immediately assumes that his mother has returned. Once he realises that Charlotte has no idea what he’s talking about he tries to back pedal and write it off as a misunderstanding but Charlotte is too smart for him and starts to come to her own conclusions thanks to his mention of Lucifer. Naturally there is a lot of confusion around the mention of a flaming sword and another universe that only makes Charlotte’s desire for answers stronger. This leads to the first post breakup scene between Amenadiel and Linda. It’s very focused on the issue rather than the extent of their relationship which makes sense considering the circumstances and allows Amenadiel to have another perspective to discuss the problem. She points out that Charlotte has been to Hell and back and that Linda had trouble accepting the truth from the point of view of mental stability. Charlotte is far from the picture of mental health so there’s no telling what the truth would do to her. Admittedly Linda doesn’t see Charlotte’s lost and confused reaction to this new out of context information so has no real idea how it is contributing to her state of mind. 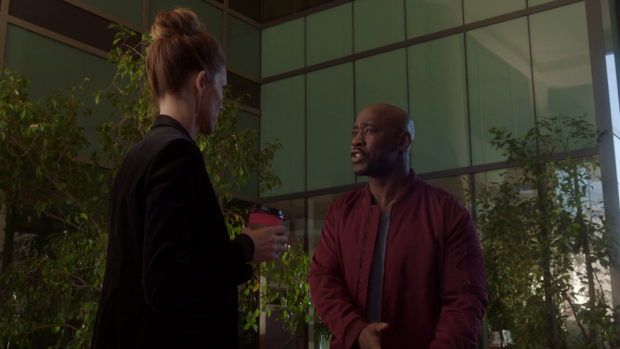 Linda’s opinion on the matter is clear though the responsibility of telling Charlotte the truth arguably belongs to Amenadiel since Lucifer isn’t willing to tell her. Ultimately he does decide to come clean with her leaving it open as to what will happen next. Maze continues down her self destructive path and is now completely unstable. We see her falling back on old habits because she has no other outlet for her rage and is unequipped to deal with it because she can’t bring herself to go to Linda for help. Her behaviour has a more detrimental effect than it would have had before because Chloe has placed her in a position of trust when it comes to Trixie. Anything she does in the apartment shared between Chloe, Trixie and Maze affects Trixie and she’s so far gone that she fails to realise that. Dan proves to be the voice of reason in this instance and does some actual parenting which is rare for some reason. He calls Maze out on her behaviour, makes it clear that he won’t tolerate this from her when it impacts her daughter. Maze takes a few cheap shots such as reminding Dan of the time they collaborated to kill someone and openly insults Trixie while she’s unknowingly in earshot before taking her stuff and moving out. Chloe isn’t around to bear witness to any of this so doesn’t understand the reasoning behind this and there will surely be a follow up to this but the approach taken here is really cutting and not in keeping with the tongue in cheek tone this show usually adopts. This isn’t a bad thing as the writers do serious very well when they want to. As of this episode Maze has cut herself off from her entire support system by leaving without telling Chloe and alienating Trixie, the only friend she has left. Dan proves to be a great foil for Maze and shows his strength of character when he remains firm on his lack of tolerance of what Maze is doing. There is a pattern to his this character is being approached emerging as he has been getting involved in things without knowing the full story. He knows Charlotte is damaged but lacking memory of her actions inclusive of her affair with him, he understands that Cain is conflicted about something but is able to supply meaningful yet generic advice about his issue and he knows that Maze is a dangerous woman who is more than a little unhinged but doesn’t realise the true extent of that. Despite that he is the perfect character to find a way to approach the situation that feels appropriate. Another strong outing that performs an impressive bait and switch when it comes to Cain’s approach to making meaningful connections. The reveal that he is only pursuing Chloe because he thinks that she’s the key to him getting what he wants adds a sinister subtext to any scene where he opens up to her. Cain would be believably well practiced at acting genuine in order to get what he wants from people so pointing out that this is what he’s doing is an impressive subversion of expectations. Flashing back to Cain in 1958 to connect the cases and solidify the deception offers an interesting snapshot into a small part of his life and the use of Kay as well as her identical granddaughter Maddie works as a way to prove his point that things move on and change while he doesn’t. 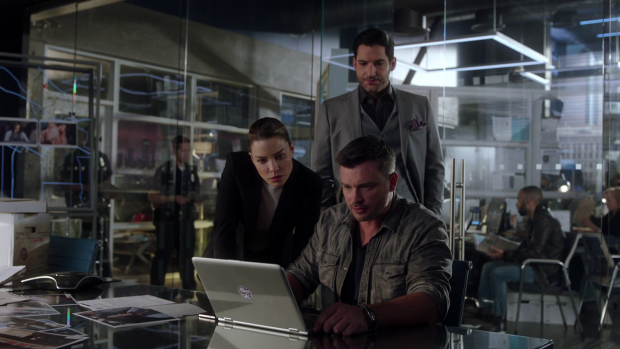 Lucifer’s territorial approach to preventing their connection makes for entertaining viewing though doesn’t hold up when considering that his insecurity is unfounded since Chloe made it clear that she values their partnership. Playing the realisation as if it was an obvious lesson that Lucifer should have learned earlier was the right call and using the killer as a powerful example of how misguided he is was a nice touch even if the case had long since become forgettable. Amenadiel’s conflicted feelings about telling Charlotte the truth after encountering her for the first time are well played thanks to some contrary insight from Linda giving him information that he has to make a decision with. Deciding to come clean should prove to have interesting consequences. Maze’s self destructive behaviour affects Trixie causing Dan to intervene and show his intolerance for her behaviour. Trixie has no outlet for her anger and doesn’t know how to deal with it so is lashing out and alienating her entire support system. It’s a more tragic and serious route than this show normally takes but is all the better for it in this case.